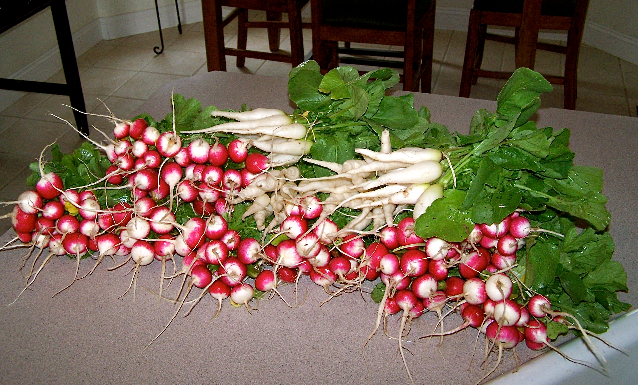 Every year I grow radishes in my garden. And they are just about the easiest thing to grow. When I first started growing them, little did I realize how much I would learn to appreciate their value. They can be planted very early in the spring and can be grown all through the growing season into late fall. And that’s one of the great things about them. It generally takes around 45-55 days before you can pick them. Radishes grow best in loose soil and last year I added peat moss to my soil and it really helped. They also need a little more water than other plants if you want them to grow well. Though radishes can be hot when eating, if they are sliced and added to a salad they add a little zest to it. And actually the more you eat them, the more you learn to enjoy them. As with other vegetables, radishes are fun to give away. I tried growing a different variety this past year and planted “white icicles” along with the usual sparklers. I gave some of them away to people and they were amazed at how beautiful they were. If you haven’t tried growing radishes give them a try, You’ll most likely be like me and find out that radishes are well worth planting!